With the MLS season rapidly approaching and players talking tougher about their demands for the new collective bargaining agreement (CBA), it helps to give some context for where MLS players stand compared to other leagues. Data is hard to come by for foreign leagues because they don't disclose much about salaries, but the other major American sports leagues are more forthcoming. By looking at the other major US leagues, we can examine how MLS wages match up against their fellow pro athletes. With those limitations aside, below are presented the five major US sports with a variety of arbitrary bits of salary information, as determined to the best of my ability using public data. We've also got all MLS player salary information in a sortable table here. There are a few things to note when looking at these numbers. MLS has a much smaller average wage and a much smaller total wage sum than all the other leagues; the $226,464 average wage is less than the minimum salary of all the other leagues. Conversely, MLS has no official maximum wage, which differs from leagues like the NHL, NBA or NFL, where there is a max possible salary and a harder and harsher salary cap. Furthermore, the other four leagues are the apex of talent and competition in the world for these sports, while the most generous MLS fan would be hard pressed to argue that the league is in the top five soccer leagues in the world. Lastly, MLS is a league that continues to grow, entering 2015 with 20 teams. The NBA, NHL, and MLB all have 30 teams, and the NFL has 32. Perhaps MLS' comparatively small number of teams contributes to some of the difference. We could go on here, but these all essentially boil down to this: MLS doesn’t compare perfectly to the other American sports. But you already knew that. That said, these are still the five major professional sports leagues in the US, and these are the leagues that we MLS fans are constantly measuring ourselves against. It’s also why this is still an interesting and valuable exercise. In some areas, MLS falls in right among the other major sports, while in others it is a clear outlier. For instance, when dividing the average salary by the median salary across leagues, MLS is on par with the NFL and more equitable than MLB. This is one way to say that MLS salaries as a whole are not as skewed upwards as those of MLB. MLS’s major differences come in the income disparity at the extremes – those with the biggest salaries are simply making much more than those at the bottom, especially when compared to other leagues. When an unheralded young player gets his first callup to the Majors, he is usually making around $500k, which is about 1/60th of the $30 million Clayton Kershaw will make in 2015. Similarly, the NBA has the highest average salary of any other league in the world (beating out the Indian Premier Cricket League. Who would have guessed? ), and Kobe Bryant makes about 40 times the rookie minimum. While MLS has the shortest average career of the major sports at only about 2.5 years, the NFL is second shortest, and presumably comes with a more severe wear and tear on the body. In that league, Aaron Rodgers’ salary is 52 times the size of the league's lowest paid player. Kaka, the flashiest name on the roster of the newly promoted Orlando City, makes about $7 million per season, which is almost 200 times what players like Dylan Remick and Bradford Jamieson IV made last year. Indeed, Kaka alone made more than the 160 lowest paid players in MLS… combined, and he accounts for more than 5.5% of total league wages; next closest is the NBA where Bryant is at 1%. *NBA and NHL Salaries were prorated linearly to fit on the graph. X-axis is reverse-ordered rank of individual player's salary. To put this disparity in perspective, if all 145 players that made less than $50,000 last season were given a modest wage increase to $50k, it would cost MLS about $900,000. That sum is less than 1/7th what players like Defoe, Dempsey, and Bradley made last year, and pales in comparison to the $200 million that is about to be spent to build a new stadium for DC United. These numbers help us paint a picture of what this small portion of the CBA means. They help explain why it just doesn’t ring true when Don Garber and the MLS ownership group claims poverty, even after they’ve signed a record-breaking TV deal and brought in the likes of Kaka, Dempsey, Bradley, Altidore, Villa, Giovinco, and Lampard for many millions of dollars each. Without a doubt, MLS is in a different place in its history, operates under different rules, and competes in a different market compared to the other four major American pro sports leagues. But it is still the apex of pro soccer talent in the USA and Canada, and so when the MLSPU asks for a raise in the minimum salary, it might be time for the league to listen. *I wasn't able to find the number of players that are measured to create the published average NFL salary, but each team has 53 players, and there are 32 teams, so I multiplied by the average salary to estimate the sum of all NFL salaries (53*32*1900000=3,222,400,000). † Because of the majors/minors aspect of MLB, median is a bit hard to judge. This article states the average salary and the number of players (910) that played last year. The median would be the 455th, player, which I found here, a list that only goes through 468. This obviously presumes that the 400 or so players not listed made less than those who are listed. In other words, this estimate may not be exact but it's probably pretty close. ‡ I couldn't find a comprehensive list of all NFL and MLB contracts and their sums, and so was unable to estimate how many of the lowest salaries were roughly equivalent to the biggest in those leagues. There is a subtle, yet very important, distinction between explanation and prediction in most sports, and Major League Soccer is no different. I don’t intend to make this long or particularly math heavy, so hang on. Here’s a simple example of what I’m talking about when I refer to explanation. In its first six games of the season, the Portland Timbers recorded 89 attempts and allowed just 57 to their opponents. During that same time, Portland scored ten goals while allowing eight. I might explain that the Timbers’ +2 goal differential was due—at least in part—to earning more offensive opportunities than their opponents. Here’s another example, but this time in regards to prediction. In their first six games, the New England Revolution scored two goals while allowing six to its opponents. During its next six games, New England scored eight goals while allowing just three to its opponents. Using just New England as an example, it would seem as though goal scoring in the past (-4) poorly predicted goal scoring in the future (+5). Of course, we have nineteen teams, not two, so I sorted through all nineteen teams looking for patterns. Here is what I found. A team’s goal differential during its first six games explained its total points over that same time period extremely well (R2 was 77%). This is not surprising. Teams that tend to score more goals than their opponents also tend to win more games. Nothing shocking there. There is virtually no relationship between how well a team scored before, and then how many points it earned later. 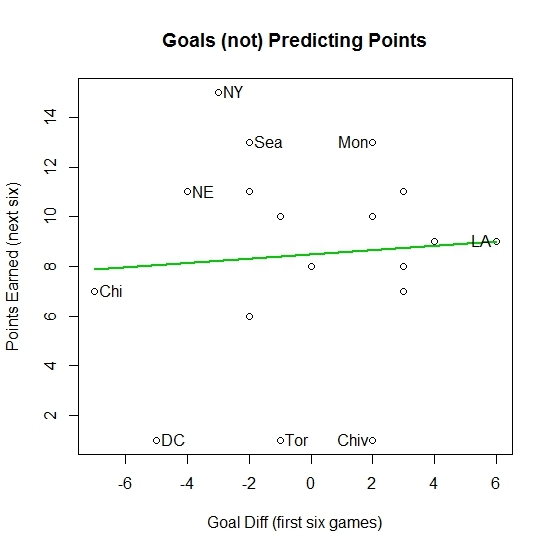 In other words, goal differentials are not predictive over six games. Because it’s sports, prediction is never going to be precise, and these aren't perfect correlations at all. 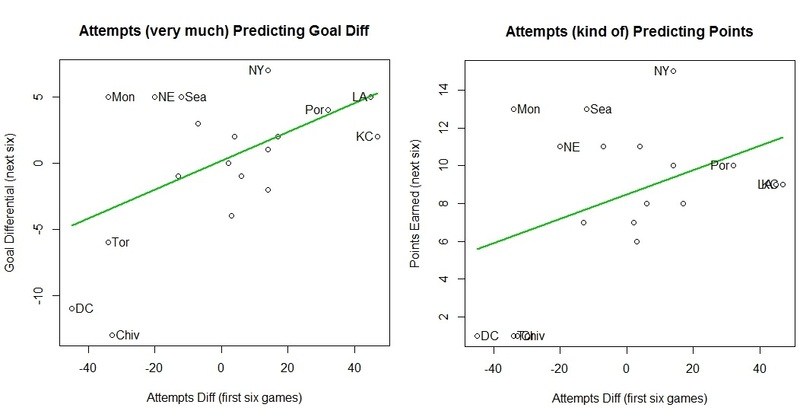 But I find it particularly impressive that over just twelve total games, the attempts data from a team’s first six games shows statistically significant predictive ability of the team’s results in the next six games. If you’ve listened to our Game-of-the-Week section during our podcasts, you hear us talking a lot about shot ratios. This post hopefully clarified why we do that. Past shot ratios are better than past results at predicting future results.